I was thrilled to find cauliflower at the Growers’ Market last weekend! Roasting this delicate vegetable gives it a whole new character – bold and nutty. A vinaigrette made with reduced apple cider and a sprinkling of pecans make this dish irresistible. Like all cole crops (the cabbage family) it goes well with mustard, so don’t leave it out even if you’re skeptical. I can easily eat a whole cauliflower all by myself this way, but it is great as a side dish with just about anything. It is a rare sight at our Growers’ Markets, but Aaron of Majestic Valley Farms in Corrales has grown a huge, beautiful crop of cauliflower, broccoli, and cabbages. I consider these crops some of the most difficult to grow in Albuquerque because of our hot summers. As I marveled, he explained that for a good yield, cole crops must be planted in July, much earlier than most people think to plant them. That way, the plants are big and healthy by the time they start to “head up” in September’s cooler weather. Next year I will have to plan ahead! They need lots of water, rich soil, and full sun. Many people think shade will keep them cooler, but they won’t grow as well. It may help to cover the young plants with a row cover during the summer, however, to keep the cabbage loopers off of them. If you see those pretty white butterflies flitting about your garden, you know you’re going to have a problem. As fall turns to winter, the cabbage family survives frosts that kill most pests, and the plants will thrive well into December and even January. The reduced apple cider in this recipe is a real treat, and if you find yourself with plenty of cider, you can make more of it using this recipe from the Washington Post. Preheat oven to 450°F. Cut or break cauliflower into about 1-inch pieces. (The smaller you break them, the faster they will cook.) Toss with 2 tablespoons olive oil on a large roasting pan, and spread out in a single layer. Set the garlic clove on the pan with it. Bring apple cider to a rolling boil in a small saucepan. The goal is to reduce it to about 1 tablespoon. It doesn't need much stirring at the beginning, but as it boils down you'll need to keep a close eye on it. Roast cauliflower for about 10 minutes, until browned on the bottom. Turn the pieces so they can brown on the other side, and roast 10 more minutes. Take out the garlic clove. Add pecans and roast about 3 minutes more, until they smell toasty. Whisk together the vinegar, mustard, salt, and 2 tablespoons more olive oil. Mash the garlic clove and whisk it into the vinaigrette with the reduced apple cider. 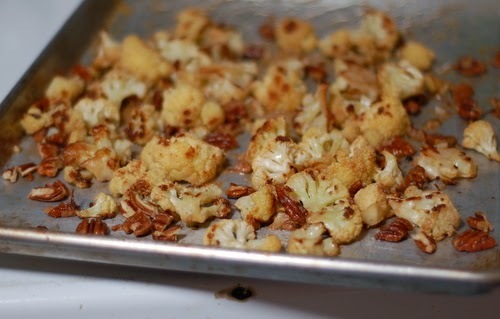 Toss the cauliflower and pecans in the vinaigrette and serve hot or warm.